Name of this dark orange flower? Hello! Sorry for several posts on naming flowers, but I have another one, please! I don't know where to start looking. The leaves are "frilly", no fragrance. On a long stem (4'? ), the flowers/buds only branch out at the top. Colors are stunning, looks like a flame! I don't think it's a type of asiatic because the foliage/petal type is so different, plus much smaller all around... but....? Thank you!! Shot of the buds too. This pic is under a light - bloom not this light orange. It's a DARK orange. Beautiful daylily, double orange. Remove spent blooms each day to allow buds to swell and to keep slugs away. Fantastic variety! Yep, double day lily, Waiting for mine to bloom. Very pretty Double Orange Day Lily! I agree with daylily. 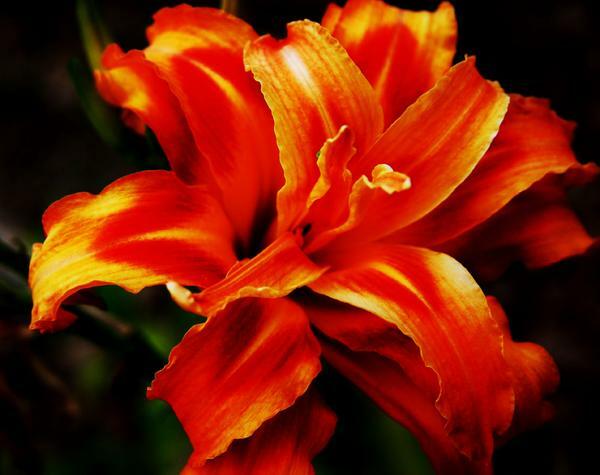 Did you Google "orange daylilies of (your area)"? Daylilies come in so many colors and varieties !!! No wonder you didn't know what it was !!! Those are very pretty !!!!! Enjoy them !!! I have a 4ft by 20ft bed of these same day lilies! They are real work horses, and it seems like nothing can kill them. Mine have gotten so compacted I need to divide some of them to thin the bed to get better flowering. They are spectacular when they are all blooming. It looks like a double day lily. I have one that looks similar.0. We call these Old Fashioned daylilies. They grow almost anywhere. I have hundreds of them. They are very pretty. I might add,,, they grow and grow,,hard to kill, you can ignore it..should be divided after a few years..roots are mangles together,,need an sharp shovel or hatchet sometimes to cut apart.....you have a nice variety..these work great along a driveway, edge of a lot,,,, no maintanance..just clean yo the stuff after they have died down in the fall,,,,,next year they come up and go crazy again..